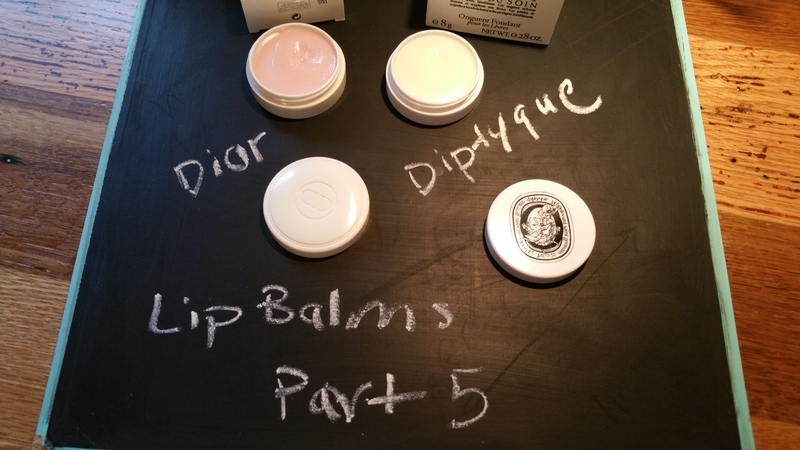 In this Part 5 of my Lip Balms and Treatments Series I am reviewing luxury lip balms from Diptyque and Dior. Diptyque’s L’Art Du Soin Soothing Lip Balm is a fairly new release, and is part of Diptyque’s skincare line. Dior’s Crème de Rose Smoothing Plumping Lip Balm has been around for a while, and seems to be ever popular at Sephora. In fact, it was on my “wish list” for over a year before I recently bought it. 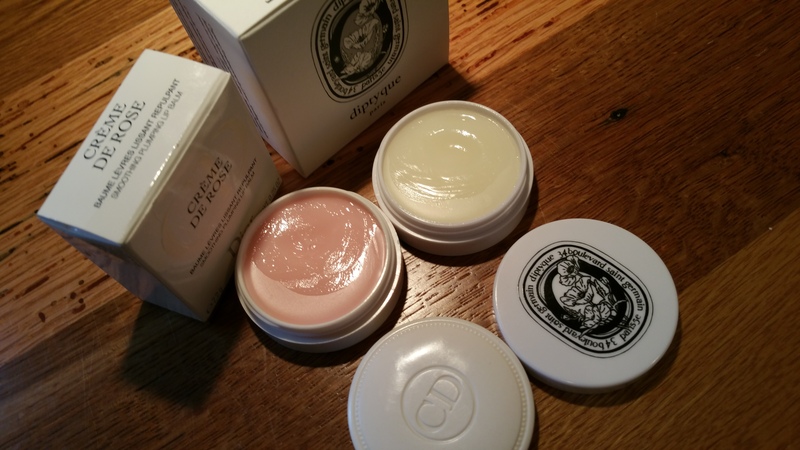 These balms are both pricey: Diptyque is .28 oz for $35 and Dior is .25 oz for $28. For some reason I didn’t look at the ingredients or notice that it has an SPF of 10, before buying Dior Crème de Rose balm. I would not have purchased it had I seen that mineral oil is one of the top ingredients and that it contains chemical sunscreen. 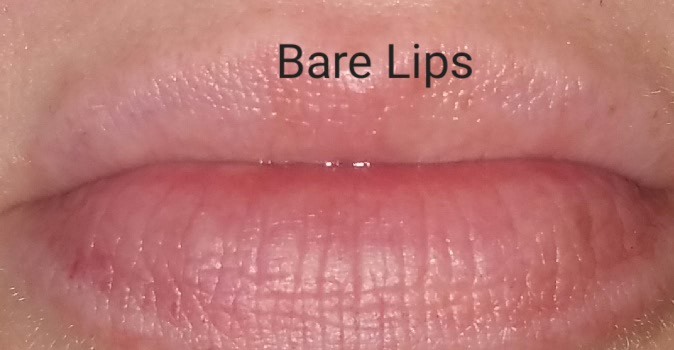 I ended up opening the balm and putting it on my lips before noticing these things, which rarely happens. 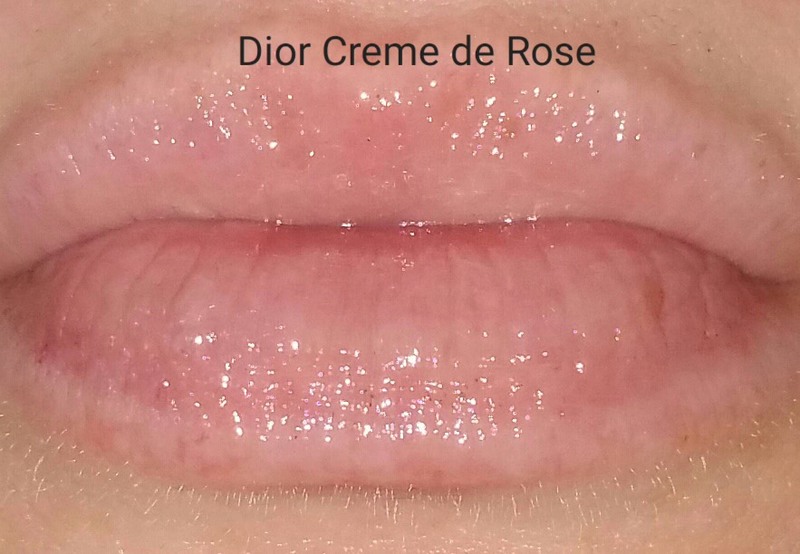 Dior Crème de Rose Smoothing Plumping Lip Balm Ingredients: Octinoxate, (Ethylhexyl Methoxycinnamate): 7.5%, Butyl Methoxydibenzoylmethane: 1%, Isononyl Isononanoate, C10-30 Cholesterol/Lanosterol Esters, Mineral Oil, Polybutene, Bis-Diglyceryl Polyacyladipate-2, Microcrystalline Wax, Shea Butter Extract, Ethylene/Propylene/Styrene Copolymer, Glyceryl Behenate/Eicosadioate, Methyl Methacrylate Crosspolymer, Butylene/Ethylene/Styrene Copolymer, Ribose, Ethylhexyl Palmitate, Polyglyceryl-2 Triisostearate, Tocopherol, Caprylic/Capric Triglyceride, Parfum, Tribehenin, ‡Rosa Damascena Extract, Commiphora Myrrha Extract, Retinyl Palmitate, Sorbitan Isostearate, Sunflower Seed Oil, Trimethylolpropane, Triisostearate, Bht, Citronellol, Geraniol, Limonene, Palmitoyl Oligopeptide, Propyl Gallate, Alcohol, Phenylacetaldehyde. [+/-: Ci 12085 (Red 36, Red 36 Lake), Ci 15850 (Red 6, Red 7, Red 7 Lake), Ci 15985 (Yellow 6, Yellow 6 Lake), Ci 17200 (Red 33, Red 33 Lake), Ci 19140 (Yellow 5, Yellow 5 Lake), Ci 42090 (Blue 1 Lake), Ci 45370 (Orange 5, Orange 5 Lake), Ci 45380 (Red 21, Red 21 Lake, Red 22 Lake), Ci 45410 (Red 27, Red 27 Lake, Red 28 Lake), Ci 47005 (Yellow 10, Yellow 10 Lake), Ci 73360 (Red 30, Red 30 Lake), Ci 75470 (Carmine), Ci 77891 (Titanium Dioxide), Ci 77002 (Alluminum Hydroxide), Ci 77163 (Bismuth Oxychloride), Ci 77491, 77492, 77499 (Iron Oxides), Ci 77742 (Manganese Violet)]. 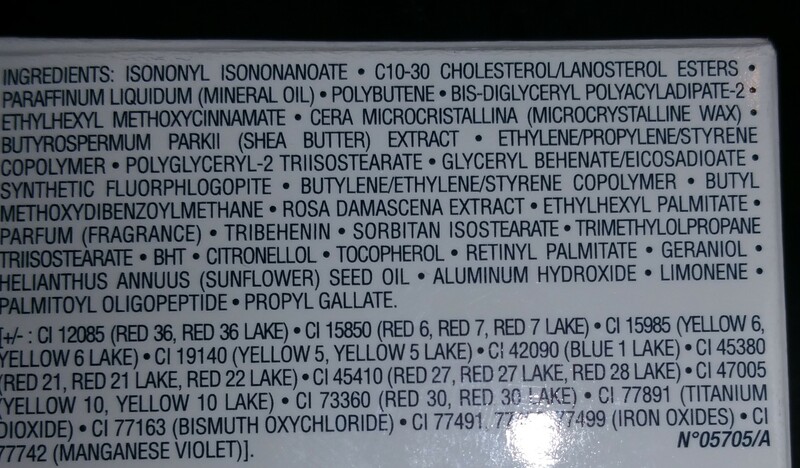 ‡The ingredients list I found online does not contain “Rosa Damascena Extract” but the packaging for my balm does list it as an ingredient. I do NOT know if and when the formula changed. Diptyque Soothing Lip Balm Ingredients: Ricinus communis (castor) seed oil (solvent), octyldodecanol (solvent), hydrogenated vegetable oil (solvent), bis diglyceryl polyacyladipate 2 (emollient), cera alba (bees wax) (skin conditioning), jojoba esters (emollient), mangifera indica (mango) seed. Diptyque, on the other hand, has a brief, good looking, ingredient list. I notice that “fragrance” is not listed as an ingredient in Diptyque’s Soothing Lip Balm, and I’m not sure whether that is because the mango seed or another ingredient is the fragrance producing ingredient. 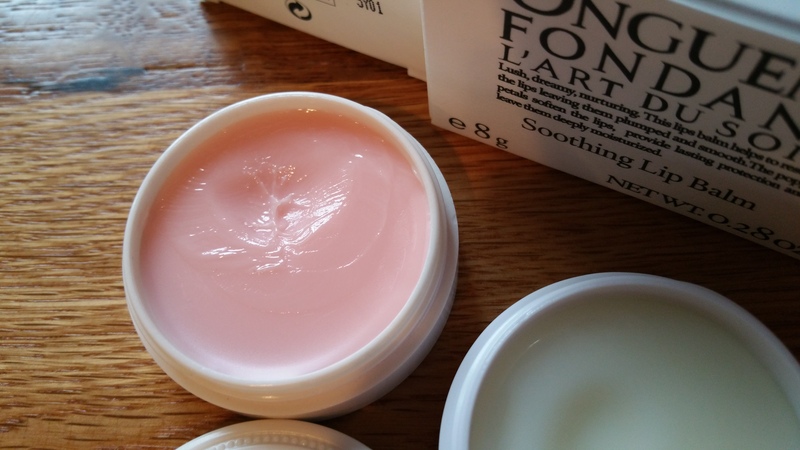 However, I don’t think it is… This balm has a noticeable and unusual scent that I don’t associate with the scent of a mango or anything else from the short list of other ingredients. Regardless of its origin, I absolutely adore the way this balm smells. As soon as I applied it I knew that I already “knew” the smell, but I could not figure out what it was or where I’ve smelled it in the past. Dior Crème de Rose Smoothing Plumping Lip Balm smells like roses, as the names suggests. I love the smell of this balm as well. For me the genuine rose scent is always appropriate and is never too much. I don’t notice a taste from either balm. Both balms soften and liquefy somewhat when they’re warmed up with a finger, but Diptyque has a definite solid-to-liquid oil consistency, like when you use solid coconut oil out of a jar. Because of it’s high oil content, Diptyque’s balm goes on thinly and creates a natural gloss. A little goes a long way. Diptyque’s balm is completely colorless. 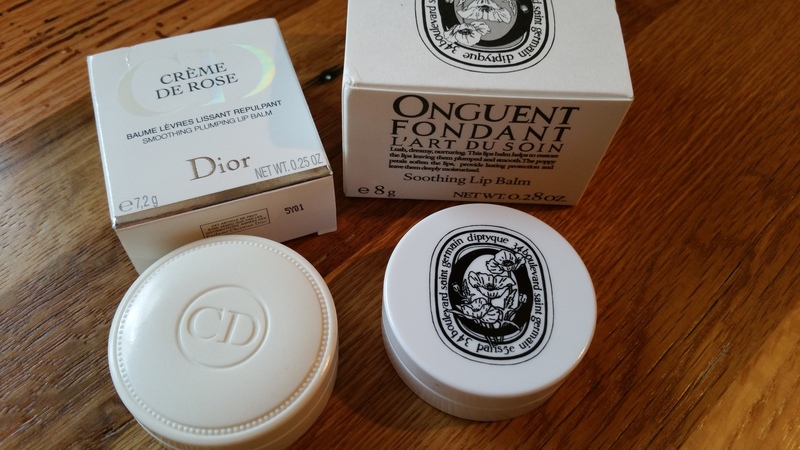 Dior ‘s balm has relatively more body to it and is less oily than Diptyque’s. I actually prefer Dior’s consistency because it feels a bit sticky (which I like), and is more cushiony and reassuring on my lips. The first time I applied Crème de Rose I totally loved it. It smelled and felt awesome going on. Crème de Rose appears pink in the jar, but does not show up as pink on my lips. When I applied some to my arm I could really see it has a creamy look rather than a jelly/clear one. There are also some faintly visible light reflecting particles visible in the jar. 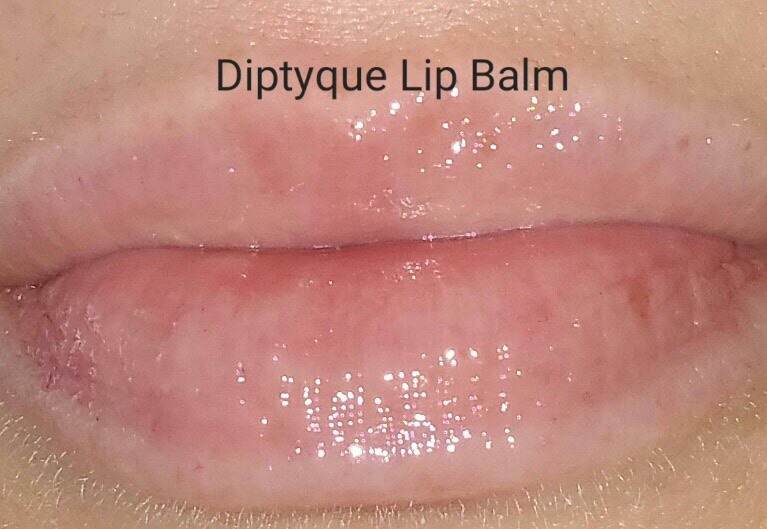 Strangely I did not detect anything on my lips when I applied this balm– It does not make my lips look plumper, either from the formula, color, or particles. It does provide a low gloss sheen that wears off with the balm itself. 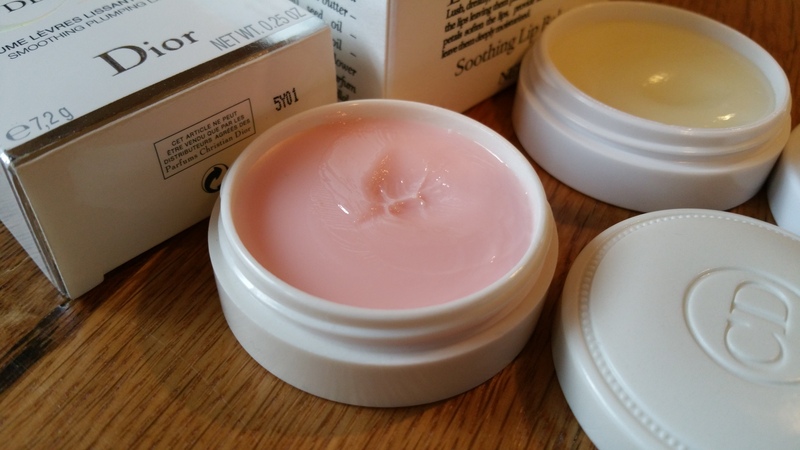 Both of these balms come in white, plastic, flattened jars with twist off lids. The outer and main packaging for both balms is very aesthetically pleasing. Their jars feel grown-up and luxurious, without being heavy from solid glass containers. Diptyque’s packaging is especially recognizable and consistent with their other products skin, body, and fragrance items. However I found it a bit odd that Diptyque’s balm came in such an oversized outer box. Diptyque’s balm looks appropriately unisex, which is consistent with their fragrances and skin care lines. (However I think the balm itself smells and looks more feminine than masculine when it’s on). Dior’s jar is almost a work of minimlaist art, and is embossed with a CD logo on the top. It feels feminine to me. I mentioned that Dior felt great going on my lips, and it continued to please me until it wore off. Then I felt that my lips were very, very dry. I tried again with the same result. I am not going to speculate about which ingredients or ingredient disagrees with me, but I will simply say that Crème de Rose was ineffective for me and I will not use it going forward. Diptyque’s balm was less pleasant going on, in terms of consistency. The thin and oily feeling it provides right after application is not really enjoyable for me. However I love the way it smells. I also think that it is effective in moisturizing and conditioning the lips. My plan it to use this balm under lipstick (using just a tiny bit of the balm so the lipstick will still be able to adhere to my lips). I also envision keeping this handy for my cuticles and for other random usages (the dry ends of my hair, for example). One last thing I want to mention is that Diptyque’s balm is getting tough to find. It went completely out of stock online at Bergdorf Goodman and Neiman Marcus, and is (temporarily?) out of stock on Diptyque’s site. I wonder if it’s a limited edition…? But either way, if you’re a Diptyque fan I suggest you buy this balm. The scent alone makes this a worthwhile purchase! Comments? Suggestions? I would love to hear from you!